What is Lean? How does it work? Why is Lean management so effective for minimizing waste? In this video, Mike from Good e-Learning takes a look at the Lean methodology, as well as its philosophy of continuous improvement. Contact Good e-Learning today to find out more! As businesses grow, it is important to maximize efficiency and cut out waste wherever possible. Not only does this save valuable resources, but it can also boost a company’s flexibility and make products and services more reliable. Constantly reassessing essential processes in an atmosphere of continuous improvement is essential, as there will always be potential to trim the fat! Fostering such an atmosphere is the primary goal of Lean, a methodology built around waste minimization. While it originally became popular as a result of Lean manufacturing, Lean management has been applied across a wide variety of industries. But what is the Lean methodology, and how does it enable companies to tackle waste? In this video, Mike from Good e-Learning looks at the processes behind Lean, along with its philosophy of continuous improvement. Good e-Learning is an award-winning online course provider which covers a variety of popular standards and frameworks, including Lean, Six Sigma, ITIL and TOGAF. We upskill students using engaging learning materials, including interactive videos, gamified quizzes and motion graphics, doing away with the endless boring Powerpoint slides used by so many of our competitors. Our courses even feature 24/7 tutor support to help students along, as well as full mobile accessibility so that they can study at any time from any device. Our quality management course portfolio offers a variety of choices for Lean students. The Lean Foundation & Management Overview course provides an excellent introduction to the methodology, which students can then build on using Lean Master Belt Practitioner course. Students can even combine the waste minimization of Lean with Six Sigma’s focus on process improvement with our ISO 18404 Lean & Six Sigma course. 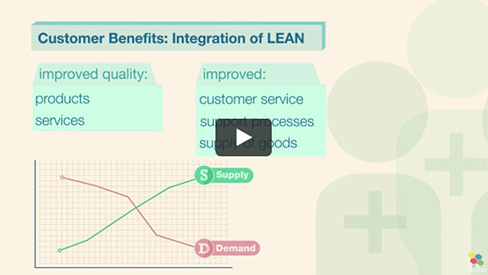 What are the Benefits of Lean?